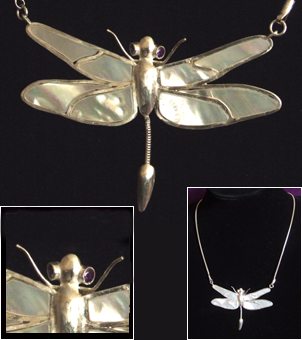 Sterling Silver Pendant on 450mm - 1.6mm∅ snake chain with Lobster clasp. 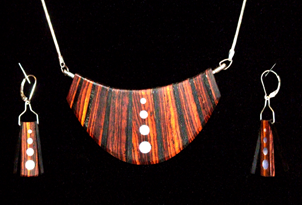 The circular wood section is Cocobolo set in Sterling Silver and is articulated around a 1.5mm axle. 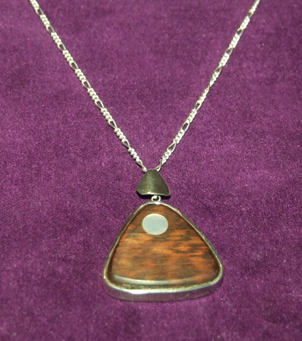 There is an opporunity to engrave initials or set a cabochon stone on this section. 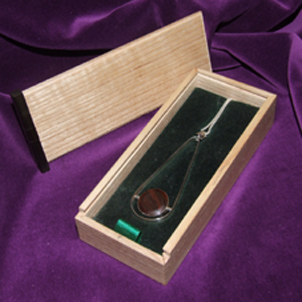 52mm antenæ to tail tip. 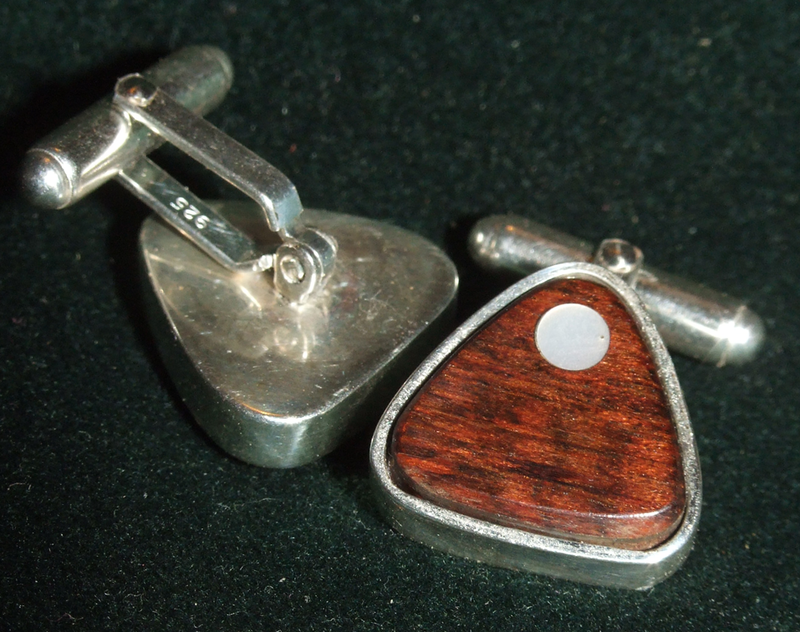 The Ear-rings have three segments with the centre one also having Mother of Pearl inlay on a Stirling Silver wire hung on safety lever back fittings. 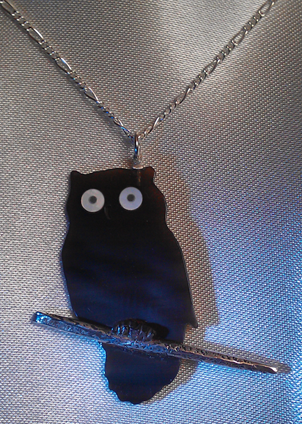 Pendant Necklace - Buffalo Horn Owl with Mother of Pearl and Ebony eyes, sitting in a textured Sterling Silver 'branch'. 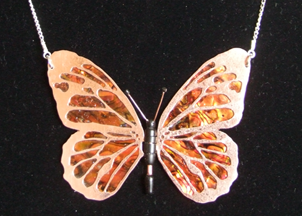 Hung on a Sterling Silver 'Figaro' pattern chain with Lobster clasp. 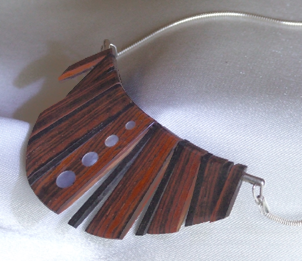 'Button' Ear-rings - Sterling Silver Crescent set into Cocobolo with stud wire and large scroll. First offering in my 'LUNA' series. 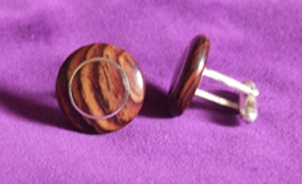 Cocobolo buttons set with Sterling Silver and Ebony phases of the moon. 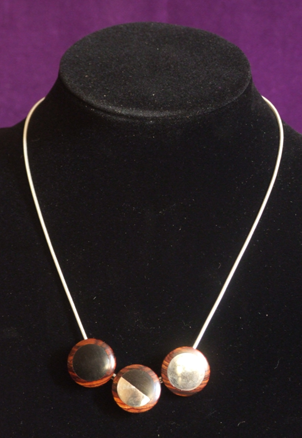 This shows New, Half and Full moons on a snake chain. 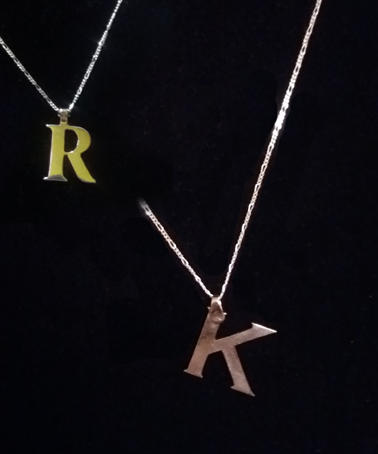 The full set will include 1/4 Crescent and 3/4 Gibous moons and each are available individually, in pairs, as ear-rings and cuff links or 1, 2, 3 or 5 on a necklace. 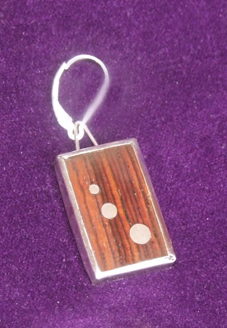 2, 3 & 4mm ∅ Sterling Silver dots set into Cocobolo, bezel set with Sterling Silver and backed with 6mm x 1mm Stirling Silver support. 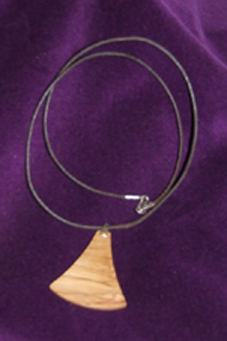 Shown as an ear-ring but could be set with a bail and hung from a chain as a pendant. 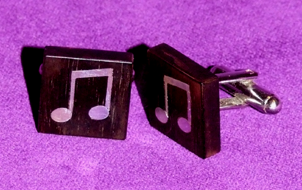 Cuff-Links in Cocobolo with Sterling Silver fitting and circular inset. 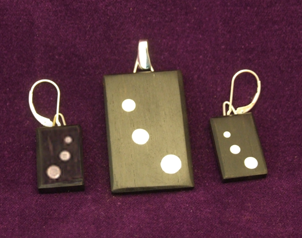 Ear-ring and Pendant set in Ebony and Sterling Silver. 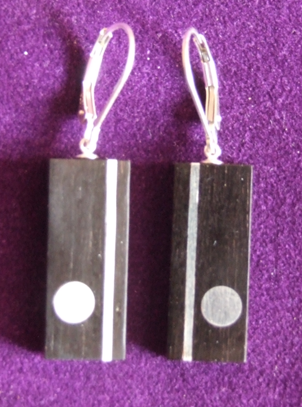 Ebony and Sterling Silver Ear-rings with safety 'lever back' wires. 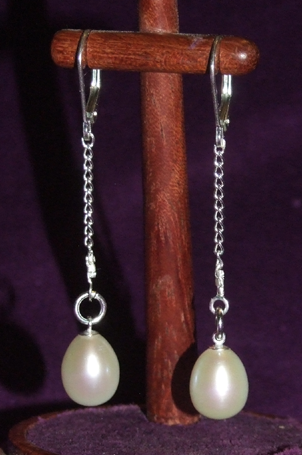 Freshwater 'teardrop' Pearls on Sterling Silver curb chain with safety 'lever back' wires. 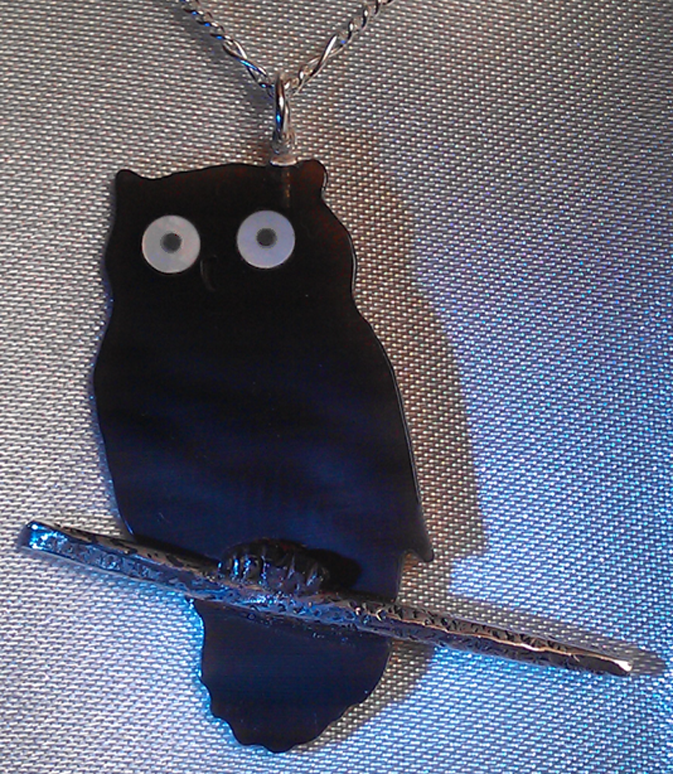 1mm sq. 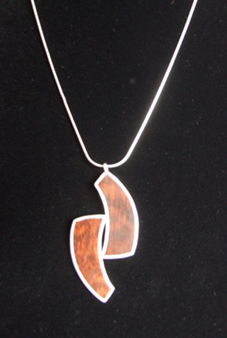 Fine Silver wire around 1mm thick Snakewood on an 18" long, 1.2mm ∅ Sterling Silver snake chain with a 'Lobster-claw' fastening. 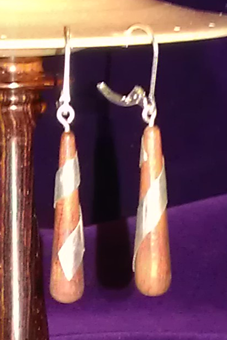 4mm wide Sterling Silver around taper turned Bubinga on Sterling Silver lever-back wires. 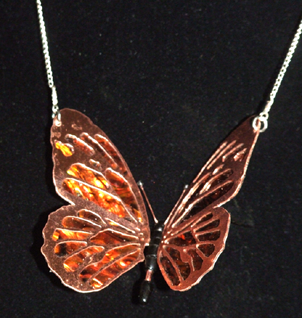 A matching Pendant for the ear-rings above. 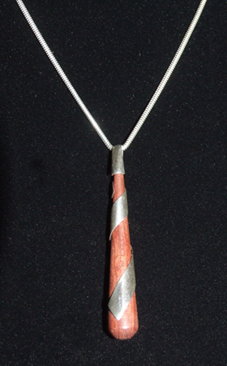 4mm wide Sterling Silver around taper turned Bubinga with a 10mm Sterling Silver bail on an 18" long, 1.6mm ∅ Stirling Silver snake chain with a 'Lobster-claw' fastening. Ebony silhouette set into Mother-of-Pearl in an Ellipticly turned Walnut frame. 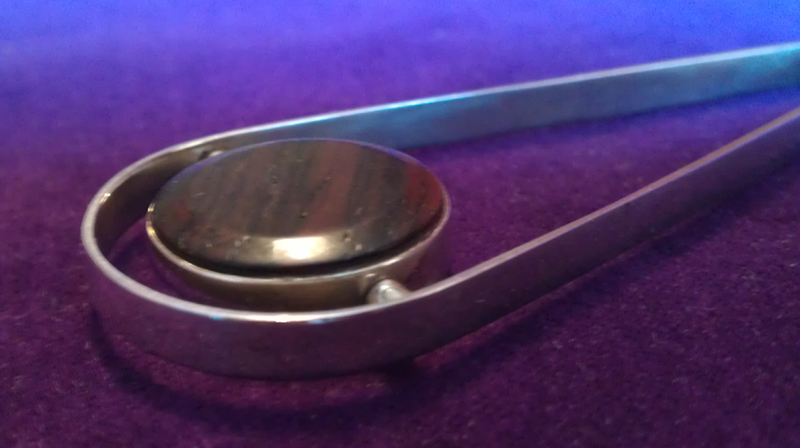 Fitted with a Sterling Silver Broach Pin but could equally have a bail for attaching to a chain. 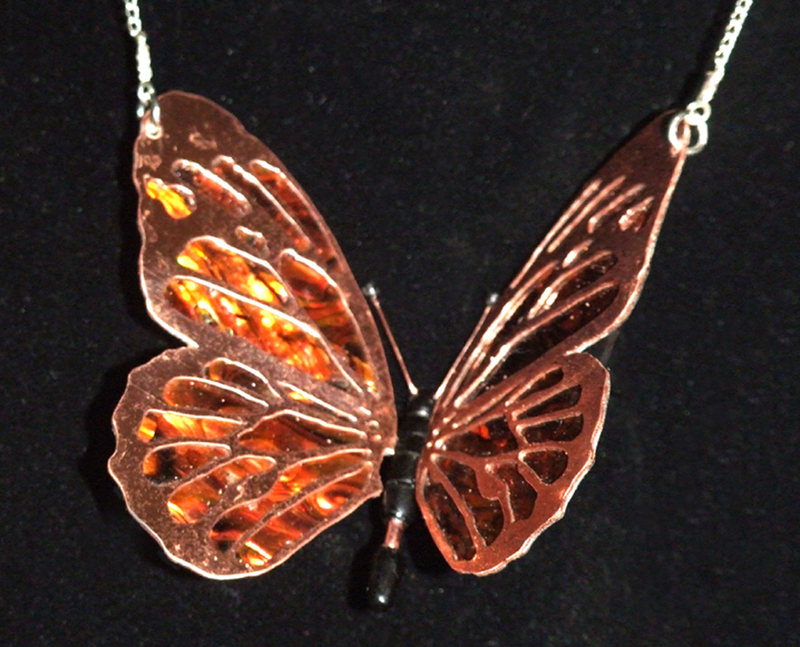 Size : 55mm x 47mm, 8mm thick. 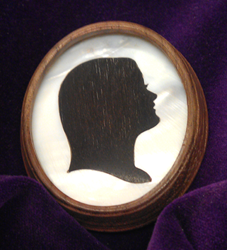 To have your own silhouette incorporated, e-mail me a profile photo for evaluation. 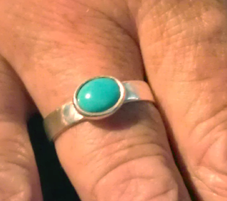 8mm x 6mm ellipse cabochon cut Turquoise set in Sterling Silver on a plain 4mm x 1mm Sterling Silver band.